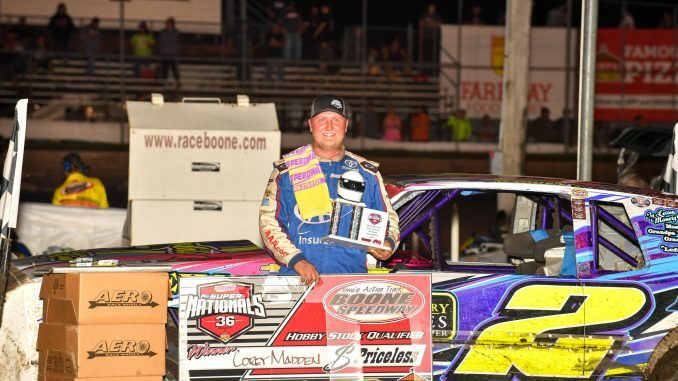 BOONE, Iowa (Sept. 3) – A borrowed motor and the top groove took Corey Madden to the win­ner’s circle in Monday’s second IMCA Speedway Motors Super Nationals fueled by Casey’s qualify­ing feature for Hobby Stocks at Boone Speedway. The eighth starting Madden passed John Watson for the lead with six laps left, earning the front spot in the middle row in the Saturday night main event. Lining up behind him will be the rest of the top eight finishers, Watson, Jeff Ware, 2016 champion Andrew Burg, 14th starting Adam Ayers, 13th starting Andrew Claus, 16th starting Drew Barglof and 26th starting Dawson DeBoer. Last year’s runner-up Madden and Watson, the runner-up in 2016, will both make career eighth Super Nationals main event starts. Burg is in the big dance for the seventh time, Barglof the fourth, and Ware the third. Ayers, Claus and DeBoer all are first-time qualifiers.